We all know that Relational Databases, in the "past", typically were used to store traditional "administrative"
and "business-like" data like Customer names, addresses, ordernumbers, prices, amounts, product id's etc..
"nummeric" (or decimal), "datetime" and the like. progressively better equiped to handle "binary" data. data as well. Usually, people call that type of data "BLOBs" or Binary Large Objects. where tablerows are stored in (details will follow soon!). So, we can easily imagine that just characters and some nummeric data can be easily stored in such a page. a pointer in the first page, that will point to a whole seperate "tree" of pages storing this blob data. storing and handling traditional data together with BLOBs. products and services. And the best way to store them seems to be a database. Inline storage, where the blobs really occupy internal database pages. External storage, where the files just reside on a filesystem, but where metadata exists in SQL Server (like pointers). External storage using additional (third party) providers, but where metadata exists in SQL Server (like pointers). Blobs in a socalled "Filestream" filegroup, which is actually a folder on a filesystem (2008). how to retrieve them (using TSQL and other programmatic interfaces), and hopefully some more interesting facts. First, we will explore the "traditional" inline storage, and work our way through the other options later on. Chapter 1. Inline storage of a blob. 1.1 Some preparations first (create a database etc..). 1.2 Adding a blob to a table. 1.3 Analysis of the (inline) blob storage. Chapter 2. Pages, extends, and other structures. 2.1 Structure of a data page, and special pages. Chapter 3. Using Filestream for storage of blobs. 3.4 Analysis of blob storage. Here we take a quick look on how we can "load" a blob (in this case, a .jpg file) into a SQL Server database. In this chapter, we will investigate "inline" storage, where the blob is stored on internal database pages. are invited to follow along. to prevent to store our objects in the "primary" .mdf file. Actually having multiple (data) files is good practice, and we should leave the .mdf file for the dictionary. All you need to do is, is to create a folder "c:\mssql\data" on your testsystem. -- as well as the datatype "VARBINARY" for BLOBs. character- or nummeric columns, for storing data like "employee name" (EMPNAME). to store "binary" data (like .jpg or .pdf etc..) in that column. Soon we will see details on that. Then, we inserted 3 rows into that table, filling the first 3 columns, leaving the EMPPHOTO to be 'null' for now. Obviously, the EMPPHOTO column is supposed to store a photo (a blob) of an Employee. in older SQL Server versions, binary data could be stored using the "image" datatype. Although this datatype is still available, the "varbinary()" or "varbinary(max)" datatypes should be used for storing blobs. Let's find out how the table is physically stored. If you created the database exactly as shown in the script above, then I am sure that our table is "page no 8"
like the fileheader (page 0), the "Page Free Space (PSF) page" (page 1) etc..
to be the DEFAULT filegroup for new objects. If you did not used the script, or used an existing Test database, the EMPLOYEE table is on different pages. In order to get "full output" from the DBCC PAGE command, let's first tell SQL Server to do so. the page number in that file, and output mode (printoption). Now, we already know the database name, the page number, and the modus we want (3 to let it be "verbose"). c:\mssql\data\SALES_DATA_01.ndf file, we now know that the file id=3. page 55 in file 3. Above, much output was skipped. Here, we see all fields of the third row. Since our table is still extremely small (it only has 3 rows), all of it "sits" in one page. Let's doublecheck that with the following. just sits completely in page 8 of file c:\mssql\data\SALES_DATA_01.ndf. 1.2 Adding a blob in the EMPLOYEE table. a photo of Albert (yuk!) into the EMPLOYEE table, and then see what has changed. be used to load a blob into a table. So let's try that. Suppose in C:\TEMP, we have the photo "albert.jpg". Ok, we see a pointerlike field in the EMPPHOTO column where EMPID=3, but how is the blob (albert.jpg) stored? we take a look at page no 8,9,10,11 and a few other pages "nearby". First let look at page 8 again, at the data related to EMPID=3 (Albert). the binary file inline, that is, really inside the database. Now lets look at some other nearby pages. for storing the blob data (the .jpg file). Then, from the output, you can see that pages 3:13, 3:14, and 3:15 are used too, as well as page 3:72.
pages 16-66, and pages 13-15, and pages 10 and 72, are used for the blob. Evidently, page 12 is a bit "apart" and it looks like the "directory" for the blob. Actually, it's the root-node (page) and it contains all information on where to find the blob chunks. If you would dump, for example, page 3:66 with DBCC PAGE, you would indeed see 8040 bytes of binary data of the photo. Except page 10, each page stores exactly 8040 byte chunks of that photo. Indeed, SQL Server "returned" to page 10 (after filling all the way up to page 72) to be conservative with pages (and extends). so any application can get a perfectly rebuild picture if requested. Fig 1. Simplified representation of the pages involved in our example. (or root page) of the blob, containing the directory (so to speak) which tells SQL Server which page stores what blob chunck. In the figure, these are the "blue" pages. but SQL Server organizes collections of 8 pages into extents (so each extent consist of 8 contiguous pages). Now, the file "albert.jpg" is 444,561 bytes in size. (child 0 up to child 54) x 8040 + (the bytes in page 10) = 55 x 8040 + 2361 = 444,561 bytes. So, from this, you might say that there is hardly any "overhead" in storing a blob, compared to the filesystem. Not exactly. First, a page is 8192 bytes, and SQL uses 8040 bytes for storing blob data. But that's not really much overhead. (using the regular applications), some "gaps" will arise, throughout the "extends". Before discussing this, we need to know how SQL Server organizes it's pages for various purposes. You can easily "play" this example by yourself. Just create a new database, and the EMPLOYEE table as shown above. Then, just use a ".jpg" file, like a photo or so, of say, a few hundreds of KB in size. Next, load the blob into the table (as shown above) and play around a bit with DBCC PAGE(). A page is a sort of "atomic" structure in a SQL Server database file (except of the Transaction Log files). 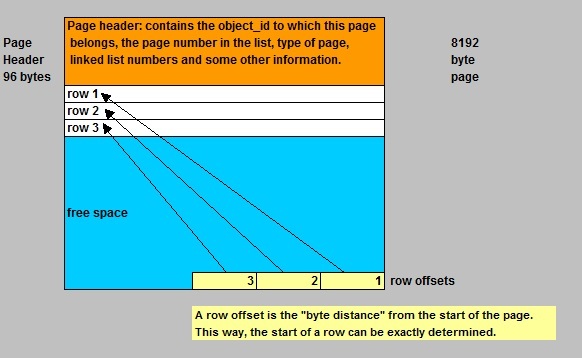 Below, you see a very schematic representation of a Data page, like used with tables. Fig 2. Simplified representation of a data page. The page header identifies the page, as to which "object id" it belongs, and some further housekeeping info. from the very start of the page. So, the start of any row can be found. Now, in the figure, you see three example rows, and below that, there exists "free space". If there is room for new rows, they will simply be added. Now, if at a certain moment, a new row does not "fit"
will be stored in that newly allocated page instead. So, if you would just have "heaps" of pages, together forming tables, it would be simple indeed. => System pages: only in the first extent, and a small number distributed throughout the file. PSF: Page Free Space page Information about page allocation and free space available on pages. GAM: Global Allocation Map and SGAM pages Information about whether extents are allocated. IAM: Index Allocation Map Information about extents used by a clustered table or index per allocation unit. => Special pages: A small number distributed throughout the file. since the last BACKUP or BACKUP LOG statement per allocation unit. or BACKUP DATABASE with Differential statement per allocation unit. => Data pages: these are the common pages in the database file. text/ntext, image, varbinary(max) and a few others. Index page Almost "the same" as a data page, except for a few things like pointers. stored a lot of BLOBs as well. are introduced, which we really have to discuss first. you will never find any of your objects (like regular tables, indexes etc...). Let's print the second page of the "c:\mssql\data\SALES_DATA_01.ndf" file (this is the file with our table and blob). This page (page 1) is the "PSF", or "Page Free Space" page. You can follow along (if you indeed created the database as shown in chapter 1). Just use the DBCC PAGE command again. Here you see the allocation status from page 0 up to page 5119 (we only have used up to page 72). with an initial size of 40MB (which is very very small). - Then, the "second" extent starts, which can hold user objects. - Then, as of page 3:16, the third extent starts. Here we find pages with blob data. other pages up to page 72: blob chunks. pages (3:73) up to (3:5119): free pages. Ok, let's first discuss a few facts about extents. As we already saw in the former section, SQL Server organize pages in units called "extents". Each extent consists of 8 contiguous pages. Since a page is 8K (8192 bytes), an extent is 64K (65536 bytes) in size. Uniform (or dedicated) extent: all pages belong to the same object (like an index). Mixed (or shared) extent: the pages can belong to two or more objects. Fig 3. Uniform and Mixed extents. Usually,SQL Server allocates multiple uniform extents for each large table. However, if a table is small, or "begins" small, SQL Server won't allocate an entire extent for it. as a pool of pages for small objects. amount of mixed extents. SQL Server ofcourse tries to save and compact space as optimal as possible. to allocate uniform extents to that object, further on, as much as possible. Also, when you create a new clustered index, or rebuild one, the pages will go on uniform extents as well. Indexes will be discussed in another section. How SQL Server "keeps track" of free and occupied extents, will be discussed in the next section. of any database file. However, as you will read below, most of them are repeated at certain intervals. A GAM page registers which extents are totally free, or have been allocated. Each GAM page covers about 64,000 extents, or about 4 GB of data. or if it is already partly allocated (partly or fully used). If the bit is 1, the extent is totally free. If the bit is 0, the extent is (partly) allocated. So, 64K extents can be "covered" by one GAM page. So, this amounts to about 4GB dataspace. So, if a datafile is larger than 4GB, at every 4GB interval a GAM bitmap page is needed. If an extent is a mixed extent with at least one page free, the bit is 1. If an extent is not a mixed extent, or it is a full mixed extent, then the bit is 0. So, this explains how SQL Server can discriminate between free or (partially) used extents. As you have seen in the former sections, the first GAM is page 2, and the first SGAM is page 3 in any .ndf file. This is page 1 in any ordinary .ndf database file, right after the fileheader (page 0). It registers which pages and page ranges are in use, or are free. If you have very small database files, then even just one PFS page might be sufficient per file. In our example sales database, we use 40MB sizes, which is ridiculous small ofcourse. But for larger database files, a PFS page needs to be repeated after about 8000 pages. is not sufficient. So, one byte per page is used. as used in our example SALES database. => The Differential Changed Map pages, track which extents have been changed between differential backups. differential backups? The differential backups are generally much smaller compared to the full backup. do not need to be backupped between differential backups. => The ML pages track which extents are affected with "Bulk logged" operations. However, both types of pages are not very relevant for our discussion. I like to pospone this one, until we have covered Btree and index structures in some more detail. Chapter 3. Using FILESTREAM for storage of blobs (2008/2012). really physically is stored on database pages. for availability, this is good. However, if the amount of blobs is very large, DBA's might be confronted with long backup/recovery times. in the fact that documents (blobs) are stored several times, corresponding to their "versions". So, if you could throttle that back a little, it might have quite an impact on the database size. might be involved as well. It seems that Microsoft takes "over" 1MB as "large", and smaller than 1MB as "small". the use of the "NT file cache". It's possible to store the blobs on a filesystem (using block IO, as well as file IO). are not stored in SQL Server, but are files on disks. There exists third-party solutions for this, as well as Microsoft implementations. Since SQL 2008, the Microsoft "FILESTREAM" feature became available. In this chapter, we are going to take a quick look at it's main features. then physically is a folder on a fileystem, where the blobs are going to be saved and accessed. there might be serious risks for inconsistencies. the "filestream clause" for that column, which makes sure the blobs then are saved to, and accessed from, this special filegroup. You can "enable" filestream "globally" on the instance level. Per default, it's "off". When you install SQL Server, somewhere "halfway", there is an option to configure the database engine. You have to watch carefully, if you would do an interactive install, because it's easy to overlook this option. Fig 5. Enabling the FILESTREAM feature at the installation of SQL Server. If SQL Server was already installed, you can still use the "SQL Server Configuration Manager"
to enable the filestream feature. Start the utility, rightclick the "SQL Server service", and choose "properties". In the dialogbox that will show up, you can choose for several settings. Fig 6. Enabling the FILESTREAM feature using the "SQL Server Configuration Manager". -- will be explained below. Note from figures 5 and 6, that you can configure Filestream for various settings. Although those figures show the same possible configurations, it's most clear from figure 6. Option 1: "Enable FILESTREAM for Transact-SQL access"
not the most flexible option. Option 2: "Enable FILESTREAM for file I/O streaming access"
If you want this too, then TSQL access is enabled, and "file i/o access" is enabled. This is very flexible, but you need to do some further research here. 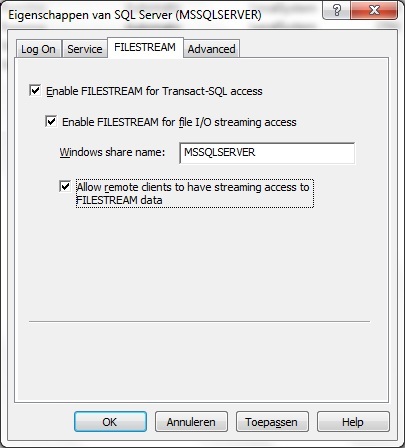 Option 3: "Allow remote clients to have streaming access to FILESTREAM data"
If you want this, then TSQL access is enabled, and "share access" is enabled. Furthermore any client can, in principle, access the share. You really need to do some further research here. which then garantees consistency, if you would use the first and second options. In this case, you can use TSQL, and also use Win32 APIs to work with the blobs. For example, the "columnname.pathname()"
method (columnname of the varbinary column), can provide a handle to a file, and further operations can take place. corresponding structured data, that is, the other fields of the table, and all optionally related tables. consistency is "at risk", unless the applications in use are truly "ironclad". You need to do more research (if you are interrested). So, I guess I try to say that there might be security issues as well as transactional consistency issues. Lets try to add a filestream tablespace to our SALES database. I suggest we make a suitable folder first. I choose to create a folder "c:\fsblobs". Inside that, I want to have a "c:\fsblobs\documents" folder. But do not create this one. That then will be the folder/container that's associated with the new filestream tablespace. will do that for us (it does not expect an existing directory). Ofcourse, the folder is still empty. We have not stored anything yet "in" the filestream filegroup. to be stored in the filestream container. in the form of "C:\fsblobs\documents\guid" like for example "C:\fsblobs\documents\25892e17-80f6-415f-9c65-7395632f0223." Then, inside such a GUID named container, we will find the blobs associated with that table. Later more on this. it will have an effect to the status of the database of which this filestream container is associated with. You might even end up with a Suspect database. It's easy to recover from this, ofcourse. But it's an illustration that any interactive access to filestream containers (e.g. using OS commands) must be avoided. So, the regular database files are always of "type" ROWS, or LOG (in case of transactionlog files). Indeed, we now have a new type of file, of type FILESTREAM, associated with the physical location "c:\fsblobs\documents". The disk(s) that hold the filestream containers does not need to be local disks. They can easily be LUNs from a SAN as well. However, all filesystems should be NTFS formatted. There are many other considerations, especially for obtaining the best performance. For example, cluster (block) size can be important, as well as the RAID level, to name a few. Let's create a DOCS table, with some regular datatypes, and ofcourse a datatype of datatype varbinary(max). Let's take a look at the columns I took here. the file extension (like. jpg or .xls) registered in the table as well. => The name "FileStreamID" is not a required columnname. It could just as well have been named "id" or another reasonable name. But we must have such a field, and it must be of a "uniqueidentifier" datatype. This is a 16-byte binary value that should actually function as a "World Wide globally unique identifier" (GUID). As we will see, it is used to uniquely determine the file associated with that record, on the filesystem. automatically, if we (or an application) do not provide a GUID for a new record. As "UNIQUEIDENTIFIER" should result in unique identifiers anyway, you might wonder what the "ROWGUIDCOL" is doing here. I believe it is not absolutely neccessary, but the efficiency gets up by using UNIQUEIDENTIFIER with the ROWGUIDCOL property. => Lastly, we have a field (DOCUMENT) which is of datatype "varbinary", and this one refers to our blob. we are going to use the FILESTREAM feature for storage of blobs. "Documents" filestream filegroup (which actually is the "c:\fsblobs\documents" container). is 8921 KB (circa 9MB) in size, which qualifies as a large BLOB. an employee photo (albert.jpg). You know how to do that using the DBCC PAGE statement. Now, we have "loaded" are large blob, but it should NOT have been loaded into database pages. From this, it is easy to conclude that our sales.xls blob (8MB in size), is not stored inside the database. If it would, then about 1000 database pages would have been allocated, which is not the case. You can see from the output, that the range of pages (3:73) - (3:5119) are still free, as they were before. which is the container of our filestream filegroup. the two new IAM pages. But there are no new pages due to blob storage. We will come back on the IAM later on. On a Test system, you could browse around through the subdirs within the "c:\fsblobs\documents" directory. Don't do that on anything labeled "production". In the figure below, you see how the storage is organized. Fig 7. Folder structure of the FILESTREAM container/filegroup after storing one blob. Here you see my "sales.xls" blob, with exactly the same size as the original file. Note the different levels of the subdirectories, each named as a GUID identifier. The "upper" GUID, represent the DOCS table. The "lower" GUID, represent the "DOCUMENT" column of the DOCS table. Let's see what happens if we load a second blob "into" the DOCS table. This time, we use the "sales2.xls" file, with a size of 5283KB, stored in "c:\temp". Fig 8. After storing the second blob. you probably will not see that the object is removed from the filestream folder immediately. First, the object is "tombstoned" and a sort of "garbage collector" will remove it permanently later. Sometimes, it is observed that this can take quite a while. There are some "best practices" in using TSQL in relation to tables with blobs. services. This means that manipulating blobs, using the filestream file API is possible. This also means that authentication to SQL Server have occurred. can be obtained. Similar code can be placed in other developing environments. - "Inline", that is, the blobs are really stored inside the database, in database pages. - "Filestream", where blobs are stored in the filesystem. Another option is the SQL 2012 "File Tables" option, which is actually a nifty refinement of the Filestream feature. which sometimes can be observed in certain document workflow appliances. be used to accesss the objects, should be "primary" in your decision. Anyway, if you are in such a situation, you got a lot of research to do. on the filesystem, and smaller objects inline. the inline option stays appealing to me. and other parts inside the database. But, an application can favour one model over the other, so it's probably best to follow the applications favourite. Use the filesystem for large objects, and inline for smaller blobs. Chapter 4. Some methods for storage and retrieval of blobs.